Maps in the Atlas cross reference climate-focused issues with an index representing vulnerable communities. With support from the Kresge Foundation, we were able to successfully complete a Climate Atlas for the city of Seattle, and advance a number of policy recommendations through the City’s comprehensive planning process. The Climate Atlas itself was developed over the course of 2016, with feedback and input from a number of local government and non-profit partners. 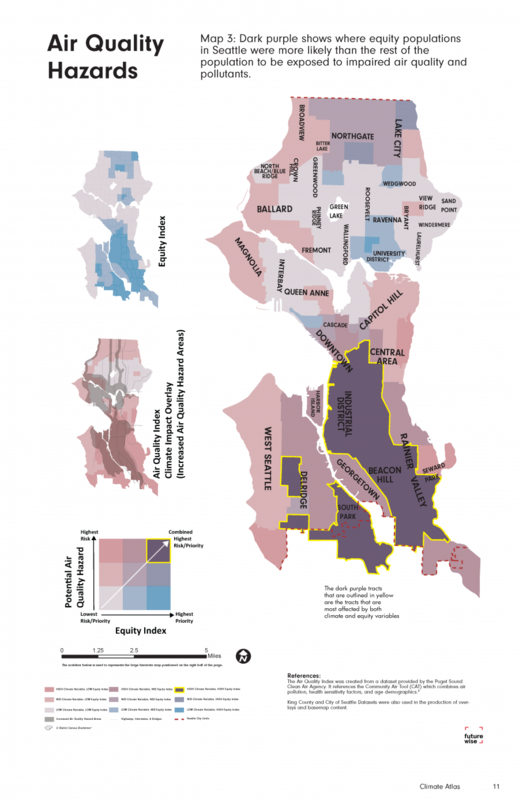 The document is designed to be viewed as a hard copy “atlas” or online (a link to the document can be found here), and contains information, stories and a series of “equity” maps that outline the impacts of climate change on vulnerable populations in Seattle. Each of the “equity” maps in the Atlas use an advanced technique known as a biaxial choropleth - each map is shaded to represent concentrations of two variables, in our case an equity index (made up of a series of equity indicators), and a secondary focus-area index such as air quality. This technique is not only successful in allowing the map user to quickly identify the map areas of concern, but it has also garnered interest among other organizations working on equity issues, such as the state’s Department of Natural Resources. The map technique and project results are being considered for presentation at the state Department of Ecology’s Climate Conference this summer. Empowering youth to raise their voices and tell their stories. There is a strong need to include and elevate community voices to influence policy, especially related to climate change mitigation and resiliency. Youth voices are particularly important in the face of climate change: more than any other group, youth will be the most profoundly affected. With support from the Kresge Foundation, we were able to promote the youth voice in our engagement and climate equity policy work in the City of Seattle. 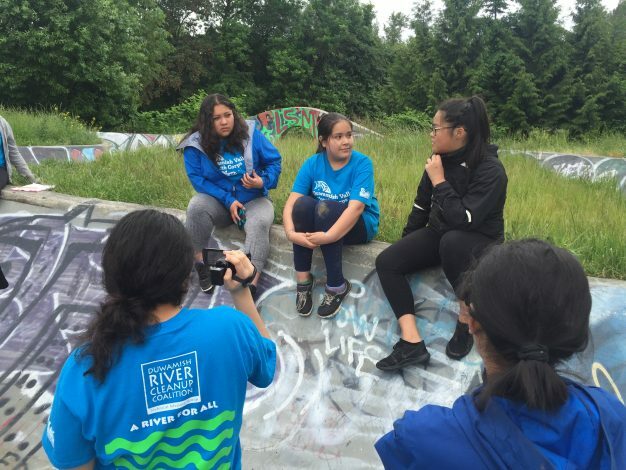 Over the course of the summer of 2016, we partnered with the youth-focused community organization Duwamish River Cleanup Coalition (DRCC) and a local videographer, Latino Communications Northwest, to engage youth in education, story-telling and video production focused on climate resiliency and community service. Between 16 and 20 youth participated in the project, which was incorporated into the annual DRCC youth cohort program. A link to their final video can be found here.